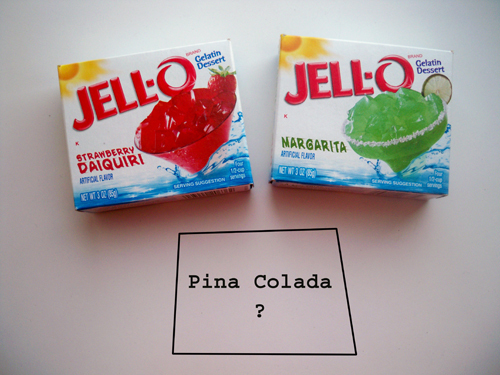 This summer there are three new flavors of Jell-O... Strawberry Daiquiri, Margarita and Pina Colada. I have been able to find the Strawberry Daiquiri and Margarita but cannot find my favorite flavor Pina Colada. It's always sold out! What the heck? Did you know Jello was invented right up the road? I bet you've already done it, but there's a museum and everything. Not the most exciting museum, but it has lots of marketing history. Hey Jenny. I found all three at a Target near me. If I see any more of the Pina Colada I will send them to you. Blogged about this a bit ago. Heh heh. have you tried buying it online? maybe amazon grocery? good luck! Oh, how fun! The strawberry daquri sounds yummy! Thanks everybody! I finally found some at a Super Target! Tasty!